Watch our full video recap of this week’s Outlander in the clip below. Well, Outlander, I thought you would leave me upset waiting for next season, but instead you gave me all the closure I was hoping for—and a storyline to look forward to! 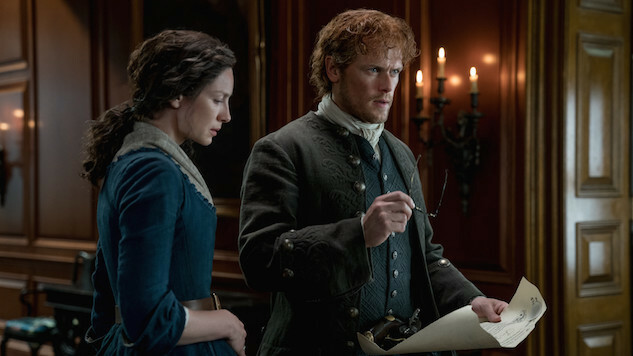 In the Season Four finale, “Man of Worth,” we get an update on the man whose stone Claire found in his skull. He was a time traveler known as Ottertooth, and this Mohawk tribe did not like him. Ian has, at some point in his travels, learned Mohawk, and is now completely fluent (it makes me wonder if he just has his Uncle Jamie’s ear for languages), so he translates for the group. He, Jamie and Claire leave the tribe without Roger. However, a woman from the tribe comes to their campground to confront them. She wants Ottertooth’s stone, even though the chief doesn’t want it near his tribe. She goes into more detail about how hated the man was in the tribe for predicting their doom. In fact, the tribe hated what he told them about the future so much that they ended up cutting off his head and burying the stone with him.This is when Claire’s story comes out. The mohawk woman wants that ghost near her to warn the tribe, so she comes to Claire, Jamie, and Ian’s aid, against the tribes wishes, to free Roger. They get to Roger and, of course, when he sees Jamie, he’s freaked out. But Claire is there and he trusts her, so off they go—straight into a battle, which ends with Jamie’s head at the end of a gun. Claire yells for peace and defuses the situation. The woman who betrayed her tribe is banished and Claire, Jamie and Ian are released, but they will not send Roger with them. Jamie offers himself in trade, but it’s too late: Ian has already made a deal and stays. It’s heartbreaking, but he seems resolved and apologizes to Roger. Jamie loves Ian. He doesn’t want to leave him, but he does. Meanwhile, Murtaugh and Jocasta are having dinner and that leads to more… a lot more. They didn’t even have to use a dating service for people over 50! Plus, he wants her to join his cause against the redcoats. Roger is now at a stop with Jamie and Claire. He loses his mind and starts attacking Jamie with his one good arm. Claire wants to interfere, but Jamie allows the pummeling. Roger is pissed, and with good reason. Then again, Jamie is mad at Roger for leaving Bree alone to get raped. Once more, Roger is shocked that the bad man was Stephen Bonnet. How could that man attack this one family so many times? They tell Roger about the baby and he is despondent. Then, they give him an ultimatum. So, when we next see them riding up to River Run to see Bree, we expect Roger to be with them. After all, he didn’t go through the stones and was abused for her. Yet he is not with them. Bree is heartbroken. They are heartbroken. It’s awful. Ian runs the gauntlet as Roger did—but unlike Roger, he makes it through and is adopted into the tribe. And when you just can’t believe Bree is going to leave River Run for Fraser’s Ridge without Roger, she sees him riding up the lane! The season finale resolves all of the season’s major plot points, and gives us a storyline to look forward to. Murtaugh is still in trouble with the law, and in the last scene, Jamie gets a summons from Governor Tryon: He needs to kill the fugitive, Murtaugh Fitzgibbons. Until next year, let the Droughtlander commence.